Shape Collage makes fun photo collages in any shape. 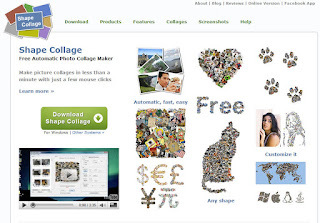 Simply download the Shape Collage software and start adding your photos. Then you choose what shape to display your photo collage. Choose from standard shapes or draw your own. Once complete you can save it and share it. Display your collage on your website, social networking sites, or add it to your classroom newsletter. Learn more about Shape Collage on YouTube.